Livonia, MI (July 29, 2005) – For enthusiasts who have been desiring and patiently waiting for the arrival of a product that demonstrates the finest qualities from America’s premiere powertrain engineers for the 2005-2006 Mustang GT, Roush Performance Products (RPP) announces that the 4.6 liter, 3-valve Mustang ROUSHcharger is now available. RPP’s team of top qualified powertrain engineers has brought ultimate meaning to the company’s bold standard, "Between a Race Car and a Road Car…is a Roush Car." RPP engineers used the same experience and expertise learned while becoming the world’s most successful Ford racers in history, to develop a roots-style ROUSHcharger that sits atop a newly designed aluminum intake manifold, making approximately 5psi of boost. Nested with this manifold is a large, free-flowing air-to-water intercooler used to cool the ROUSHcharger discharge air for added performance. 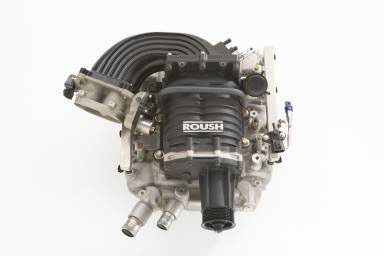 Additional features of the system include a larger fresh air inlet, low-restriction air filter, large diameter clean air tube, single belt driving the ROUSHcharger and all engine accessories, intercooler heat exchanger and pump, and unique Roush calibration. High flow fuel injectors and lower heat range spark plugs are also included to support the 410hp (@6300 rpm) and 385 ft-lbs (@4500 rpm) of torque and to ensure long-term reliability and performance. The ROUSHcharger can be installed in 8 hours and, as with all superior Roush powertrain products, is backed by an industry leading 3yr /36,000mi warranty that includes coverage on all ROUSHcharger components, as well as, the vehicle’s drivetrain components, including: engine, transmission and rear axle. Roush Performance is the street performance division of Roush Enterprises, parent of Roush Racing and Roush Industries.